When the New York Times described Andrew Smith’s work as “mad science and vomit turned into art”, it was meant as a compliment. 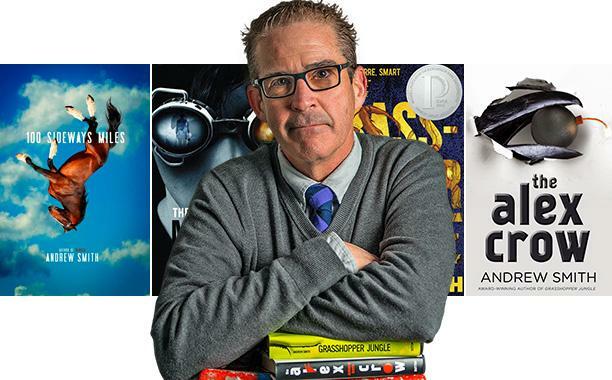 The Californian author’s penchant for crazed science fiction, dark humour and searing insights into the human condition have resulted in nine (soon to be ten) books of stunningly inventive young adult fiction. Last week at the Edinburgh International Book Festival, though, Smith insisted that the fiction he writes is about young adults, rather than being exclusively for them. Indeed, such is the universal appeal of Smith’s lovably bizarre yet heartfelt stories that it’s surprising more UK readers haven’t heard of him. That may be about to change, though, with Spaced and Shaun of the Dead director Edgar Wright getting set to adapt his 2014 novel Grasshopper Jungle for the big screen in the near future. Smith’s talk at the book festival was centred mainly on that book and his 2015 coming-of-age/historical drama/monster story/techno-thriller The Alex Crow, and – perhaps unsurprisingly – the unclassifiable nature of his work was one of the main talking points. Critics generally can’t pin his novels down, said Smith, so just end up comparing him to a whole raft of different authors. He was, however, happy to acknowledge the influence of Kurt Vonnegut on his work, a writer with whom he shares an impressive talent for making the extraordinary seem ordinary, and an ability to captivate readers with wilfully fragmented and beguiling narratives. Smith also talked briefly about his creative process, and how he constantly feels the need to strive for originality and freshness in his work. Despite dealing with story ideas so byzantine it’s impossible to ever condense them into an “elevator pitch”, he never outlines his books before writing them, a tendency which has led many a high school English teacher to denounce him as an insurrectionist! Everyone has to find their own way of writing, he said, and his just turned out to be a little unconventional. Often he’ll come up with a host of wacky ideas and then synthesise them into a single story; this is what happened with The Alex Crow, where a historical expedition to the Arctic, the true story of a kid from Syria and a deep mistrust of humanity’s unchecked technological progress resulted in a story that is equal parts funny, scary and moving. This refusal to conform to genre convention allows Smith to carry on creating wildly imaginative work, but it hasn’t all been plain sailing. In 2011 the Wall Street Journal ran an opinion piece which claimed that young adult fiction was becoming “too dark” for teenagers, and made reference to Smith’s 2010 fantasy-horror The Marbury Lens. The idea that his work might be considered harmful to children was deeply unsettling for the author, and for a while he considered giving up writing altogether. 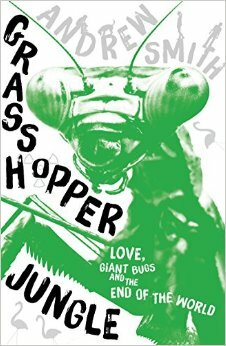 Thankfully, though, he bounced back with Grasshopper Jungle, a work of boundless imagination which won the 2014 Boston Globe-Horn Book Award, one of the most prestigious prizes in contemporary American children’s literature. Not one to be cowed by the threat of controversy, Smith continues to forge ahead writing fascinating, funny and frightening stories with a profoundly human heart. The one he’s working on just now, he said, will be published in Autumn 2016, and concerns the prosaic subject of robots and zombies….in space. Knowing Andrew Smith, though, there’ll be far more to it than that.